New kernel some new surprises (think vasm control center) lots of fixes. Please everyone try this. We are close so want to get the last wrinkles out. We have a preview of vasmCC in there not quite done yet but want some feed back. It's looking better keep those cards and letters coming. If your a vectorite then you want to be proud of what goes out to the next generation of vectorbies.............lets make it so! Installed flawlessly with defaults. Although I did choose nv for vid driver. Noticed that the stinking caps/scroll/num lock led's do not work. Although they do function. I've yet to get Xfburn to do anything. Starting via Xfce menu just yields a busy mouse pointer until it finally passes. But clicking the menu entry again will open it up. I noticed when running ps aux that the first attempted xfburn process (executed by menu) never terminates. When there is a instance of xfburn running, you are able to open xfburn successfully, but it won't pick up any of the devices. Also, the orphaned process will tie up my CDROM drive preventing mount or umount. My CDROM is not a burner. hdc is my burn/read anything device and hdd is merely a cd reader. CDROM mounts fine when the xfburn process isn't dinking with it. Starting xfburn via cli reveals nothing exciting at all. It just hangs without any output until I get bored and stop the process. Root cli has all the same results. Missing icons in Xfce menu still. "About Xfce" and the two from the settings submenu "Autostarted Applications" and "Database Access Properties". VasmCC- Nice addition, I think it will be gratefully accepted by users. Nice work Moe and friends! But... when selecting "X Window" catagory, when the text goes bold. It expands to two lines. The second line goes out of the container making it unreadable. Also noticed the "Exit" button text looks.... weird sometimes until you mouse over it. Then it straightens out. Alright, I'm gonna come right out and say it. I hate the look of the "vsuper" dialog. I hope you'll consider adding gksu to the iso so vsuper will detect and use it like the good ol' days. Thunar File Manager (root) added. Thank You. That's about all I've noticed at this time. Sorry for sounding so picky, but Gold is rapidly approaching so I thought I'd bring up things I'd normally not worry about. What screen resolution are you using? I too hate the looks of everything after you click on the icons on vasmCC, but not much we can do there ATM... maybe later. Now we see how modest you are. 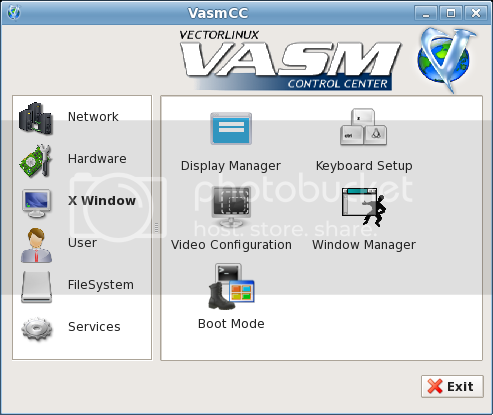 The VasmCC was written by Moe and the desktop launchers were put together by Nightflier and Exeterdad. I dont see any of the problems you mentioned with vasmCC here. can you post a screen? Here's two screenshot's. First is VasmCC as seen when first opened. Then after clicking the "X Window" catagory. Resizing makes no difference. Even dragging center divider to the right. Even maximized doesn't straighten it out. But it sure gets big I can't seem to duplicate the "exit" button thingie. Maybe it was a fluke. I wasn't talking about the dialogs while using VasmCC. I was talking about how I hate the looks of "vsuper" when we need to supply a password for a privileged task. But, I agree with the appearance of the dialogs after the VasmCC frontend. But without some serious work to the VASM scripts, or a seperate VASM-like system we're gonna have to deal with it. VASM doesn't require X.
Edit: Dang... I wish I would of thought to add NIGHTFLIERS icon entries into my VasmCC before the screenies. What you see folks is the VasmCC as it is on the new ISO. Uelsk8s above screenshot shows nightfliers "a little too late for ISO" menu icons installed. And... Uelsk8s did a lot with VasmCC as well. Not sure exactly what, but he sure orchestrated a lot via PM. Finally finished downloading (worst for a long time), and installed. Install was fine, though "linux2" is still unusable for me - I can't select UK keyboard layout booted from it. YASMCC looks good, though I'm having the problem already mentioned with the Xwindows selection. The mount applet in VASM still has problems - attempting to add /dev/hda1 (NTFS) still results in an fstab which lists it as XFS. Still missing a few icons in the menus - missing are About XFCE, Autostarted Applications, GTKFind and PPRacer. I also tried Edit > Unmark all, but it didn't work - had to exit and restart to clear the execute list. Wow, that vasmCC looks pretty cool! should we give our thanks to the gambasian fellowship? I'm downloading as we speak. It is SLOOOOW! I started late this morning and at about 35% it errored out and I had to start all over. I hope it'll be done before I go to bed. Thanks for the reminder. My download errored out AGAIN, so this time I'm using wget. I usually use Opera for downloads and it will resume a stopped download, but not an error. Maybe the slowness of the connection is causing problems. I'm getting better speed now, too. wget is reporting 3-1/2 hours to go. Just started downloading at around 40 Kb/sec. That will take 4½ hours with prozilla.